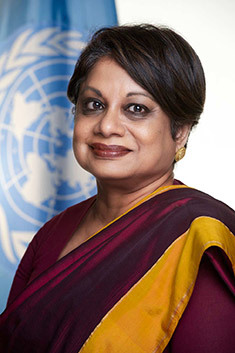 Radhika Coomaraswamy was a former Under Secretary General and The Special Representative on Children and Armed Conflict. She was the lead author of the Global Study on the Implementation of Resolution 1325 published in 2015 and was the Special Rapporteur on Violence Against Women from 1994-2003. In Sri Lanka she was the Chairperson of the National Human Rights Commission from 2003-2006. She began her life as an academic at The International Centre for Ethnic Studies in Colombo and has also taught at the New York University School Of law in New York.